Wow, these are beautiful! And affordable! Enter below to win these faux diamond earrings, then leave me a comment. Thanks! 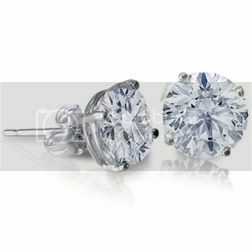 This beautiful 4-carat Pantina Diamond Veneer Stud Earrings is a Cubic Zirconia stone dusted with 100% real diamond particles to create a sparkling veneer which makes it look like real diamonds. This gorgeous pair of studs retails at $195 and was featured on The Today Show's Jill's Steals and Deals segment. Check out Life's Cheap Thrills Pantina Diamond Earrings review. This giveaway is open Worldwide (void where prohibited by law), ages 18 and up, and will end on January 16th at 11:59pm EST. Get a head start by following Say Hello Diamonds on Facebook! Ready to win? Enter on the Rafflecopter widget below! Disclosure: I did not receive any compensation for this post. This blog is not responsible for prize fulfillment. I like the Lucy earrings! I love the Cebu necklace, it's intricate & so lovely. I like the Bethany ring. I like their heart and circles bracelet. Thanks for the chance. The Malena Ring set is so beautiful. I would love to keep this for myself. Stunning. I love all the products but simple diamond ears are a classic. I like the Swarovski Crystal Elements Stud Earrings. The black jersey scarf is extremely cute and elegant.